Medieval Ghent was prosperous, thanks to the cloth trade, and at the time one of the largest cities in Europe. Eventually its fortunes declined. Today textiles are still an important industry and the city is home to the largest university in Belgium. However, the central core of the city contains many beautiful old buildings and it's compact and easily walkable. There are a lot of elegant looking shops. I have a feeling that Ghent may be slightly overlooked. I know that Bruges is currently the favorite destination for tourists; I was not able to do any sightseeing in Bruges, but I'm sure it is a great place. However, if I were going to vacation in Belgium, I think I would head straight for Ghent and spend some time there. I really liked it. We spent the morning in Ghent doing a guided walking tour. It was a cold, rainy day, unfortunately. 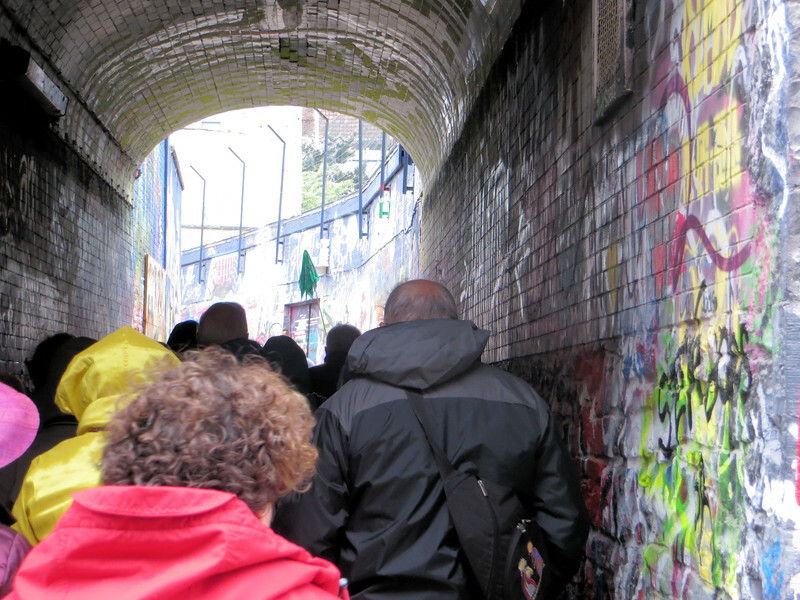 Our guide started the tour by taking us down this narrow street (really an alley) which the city had designated as a place where graffiti artists could have free rein to paint . I think the hope was that the rest of the central city area would then remain graffiti-free.